Recipe: Mix 1 cup cranberry juice and 1/2 cup orange juice in a pitcher. Pour a little bit in a glass. Add equal parts ginger ale and champagne. 4- Thanksgiving Desserts by Robin Missry- Amazing ways to use marshmallows and rice krispy balls! 5- Thanksgiving Cake Pops by @nshamah on Instagram. 6- LOVE the turkey/breads/pumpkins/candle decor! By Amanda Cohen. 7- Fantastic pumpkin/floral/candles modern centerpiece by Pauline Shabot. 9- Rustic yet elegant Thanksgiving Table by Manie Dweck. 10-Turkey Cookies by Nestle. Genius!!! There is nothing like a fresh delicious chocolate chip cookie. This is why I make the batter and freeze them raw. I can pull them out and just bake before serving. My sister in law Allegra is famous for her Hanuka and Purim parties. She puts extra special effort into making these holidays exciting for all her kids, nieces, nephews, and all of the extra guests that seem to find their way into her home. This is her favorite sugar cookie recipe. It tastes best when rolled out very thin and topped with fun sprinkles, frostings, chocolate chips, or whatever sugary toppings that you can concoct with your kids. Don’t forget to buy your Hanuka cookie cutter shapes! Don’t miss a single recipe or any of our gorgeous table setting ideas! Thank you Susan for sending in this chocolate lover’s dream cookie! Looks yummy and easy to whip up! Enjoy these killer cookies that do a lot to help the “medicine go down”. I have friends who come to my house for a meal because these cookies will be served. 1. Melt unsweetened chocolate, 1/2 c chocolate chips, and the semisweet chopped chocolate with the butter in a pan placed over simmering water. 2. Sift together flour, baking powder, salt (or mix together with a whisk). 3. Combine eggs, sugar, espresso powder, vanilla. Fold in the cooled chocolate mixture. 5. Chill for at least 1 hour do not chill overnight (becomes too hard to handle). 7. On buttered & floured cookie sheet or parchment paper lined cookie sheet, place rounded tablespoons of dough. 8. Bake 7 – 10 minutes. Carefully remove parchment paper to cooling rack, when cool enough to handle, using a spatula, remove from paper and allow to cool completely before packing in airtight plastic bags for freezing. Or serve NOW!! These cookies a great cold – do not store in the refrigerator – they will dry out. Debbie’s Not “JUST” for Passover Cookies! Any recipe that I get from Debbie Gindi is sure to be a guaranteed winner. Debbie is ahead of every trend in town, especially the food and table decor scene. I have a fast,easy and elegant passover cookie recipe that all your guests are sure to love. My family and friends love these sweet chewy treats so much I bake them all year round,hence the name!! NOT JUST PASSOVER COOKIES! You can also add mini chocolate chips,different nuts or extracts to change them up a bit! I even spread the flat side with seedless raspberry jam,sandwich two cookies together and dipped in melted chocolate for variation! Either way these are sure to be a big winner with everyone! Form into teaspoon size balls. Place on lined cookie sheets 1 inch apart. Bake for 15-17 minutes. I love your blog and I’m always checking in for beautiful inspirations! I recently had my daughter Giselle’s first birthday party and I thought I would share the results. The theme was princessy with lots of hits of pink and royal purples. I made the cake, matching cookies, cake pops, chocolate lolly pops and macaroons all to coordinate with the theme. Watch this authentic Italian grandma knead her biscotti dough. She has all the time in the world and puts real love into that dough!!!! In Italian, the word “biscotto” means “biscuit” or “cookie.” The root words “bis” and “cotto” literally mean “twice” and “baked.”Bakers shape the dough into a log, bake it, evenly slice it into cookies (hopefully they stay in one long piece), and then toast and turn the cookies again until they are perfect. Biscotti have a great shelf life of at least a week, but they stay even longer if you seal them in an airtight container in the freezer. They are margarine and oil-free so treat yourself to one after dinner! Great to keep in the freezer for an unexpected guest! Thank you Eshter Serouya for the great recipe! place 1/2 cup of the almonds into a food processor ,grind and set aside. combine flour,baking powder,salt,sugar. add the almonds. with the paddle attachment beat in the eggs,vanilla and almond extracts.add chocolate chips and remaining almonds. shape into thin logs and place on greased baking tray. bake for about 30 mins or until golden. remove from oven. when they are warm(not completely cooled),slice thin at a diagonal angle and re-toast for 5 minutes. Looks like a new-fangled contraption, right? Truth is, the cookie press has been around for almost fifty years. Want to turn out buttery spritz cookies? How about homemade Milanos? Then you’re going to want to invest in one of these, and you will never have to reach for store-bought versions again. The science behind the cookie press is pretty simple: fill the tube with cookie dough, and fit one of the metal disks at the bottom. Then, press the bottom of the tube right on to the cookie sheet, and press. When the dough comes out, it forms shapes corresponding to the disks. Flowers, hearts, squiggles, snowflakes – the designs that are available will vary depending on the brand you buy. You can’t use just any cookie dough recipe here, since the dough has to be the right consistency to fit through the disks. I provide my recipe below, and most cookie presses come with a recipe in the box. For the press to work, your dough cannot be refrigerated. If you do need to make your dough in advance, make sure it comes to room temperature before filling the tube. So what can you use your new contraption to make? How about a homemade version of those classic swiss fudge cookies from Stella D’Oro? Make the flower shape and then fill the centers with a little chocolate ganache. What about your own version of Milanos? Two oval shaped cookies, sandwiched together with a little melted chocolate – voila! The opportunities for your new gadget are endless, and any of the varieties would be great to slip in to your Mishloach Manot for Purim. You can top your designs with sprinkles, colored sanding sugars or even pieces of fruit. You’ll get 10 phone calls asking how you made that cool design! Add in the egg, vanilla and salt and beat until combined. Fill the cookie press with the dough and fit the disk on. Press the cookies out onto ungreased baking sheets, 1 inch apart. Bake on 375 F for about 10 minutes, until just lightly golden. Transfer to wire racks until cool. Laura sent me this recipe a couple of weeks ago, and since then, I’ve made it at least 4 times, each time with a different twist. You can throw in sesame seeds, slivered almonds, walnuts, even ground flax seeds or chocolate chips. Mix and put on parchment paper make small teaspoonfuls and flatten or make whatever shape u want – it doesn’t change in the oven. for crispier cookies, flip onto the other side for another 20 minutes. Send in your favorite easy, healthy recipes to marlene@thejewishhostess.com. Every submission will be entered to win any Susie Fishbein cookbook! In food processor chop the cookies to from crumbs. Press on bottom of tin and bake in 350 degree oven for 10 minutes. Separately combine corn syrup, chocolate syrup and peanut butter mix until smooth . pour on top of ice cream smooth out top with knife and freeze . When firm ready to serve. Check out Blossom Bleu on the New Kings Highway for all of your giftware needs. Have you been eating twice as much chocolate now that studies have shown conclusively that this miraculous bean is actually good for you? It’s certainly more appealing than gulping down a $7 wheatgrass shot with the rest of the aerobics squad at the health-food store. Here, then, is BabyCakes NYC’s ode to cocoa: A tried-and-true chocolate-worshiping recipe with crunchy edges and a soft, chewy center that will put you in antioxidant overdrive. Bonus tip: You can add minced fresh mint to the dough, its delicious! In a medium bowl, mix together the oil, evaporated cane juice, applesauce, cocoa powder, salt, and vanilla. In another medium bowl, whisk together the flour, flax meal, baking soda, and xanthan gum. Using a rubber spatula, carefully add the dry ingredients to the wet mixture and combine until a dough is formed. Gently fold in the chocolate chips just until they are evenly distributed throughout the dough. Using a melon baller, scoop the dough onto the prepared baking sheets, spacing the portions 1 inch apart. Gently press each with the heel of your hand to help them spread. Bake the cookies on the center rack for 14 minutes, rotating the sheets 180 degrees after 9 minutes. The finished cookies will be crisp on the edges and soft in the center. Let the cookies stand on the sheets for 10 minutes, then transfer them to a wire rack and cool completely before cover­ing. Store the cookies in an airtight container at room tempera­ture for up to 3 days. Recipe and above text Courtesy of BabyCakes nyc. 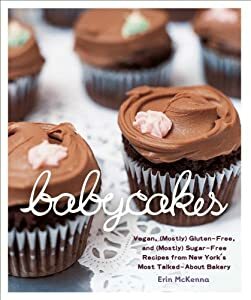 Check out BabyCakes Bakery for all of their delicious desserts. I especially love their vanilla cupcakes.